Run Intuiface on a Mac by creating a Windows partition using Boot Camp. The benefit of this approach is you will achieve maximum performance as all system resources will be dedicated to running Windows and Intuiface. Boot Camp is no-cost software from Apple that enables Windows to run natively on a Mac. It requires that only one OS be run at a time, meaning Windows can't run side-by-side with the MacOS. However, performance will be excellent. Intuiface's minimum system requirements are sufficient to work with Boot Camp. Run Intuiface on a Mac using virtual machine software. The benefit of this approach is it enables you to use your Mac-based software at the same time as Intuiface. Note that this side-by-side convenience does mean Windows will share system resources with MacOS and thus performance will not match that of Boot Camp. Regardless of the virtual machine platform you choose, we suggest allotting at least 3.5GB of RAM and a good percentage of the CPU core to the virtual machine. Parallels enables you to create a Windows "virtual machine" that can run side-by-side with the MacOS. VMware proposes Fusion 8, a virtual machine optimized to run Windows 10 on a Mac. The above virtual machine references are not formal endorsements. They are simply popular options listed for your convenience. Check whether the path of your experience is listed in Composer's title bar as "\psf....\myExperience.ifx"
If yes, you will need to disable "Shared Profile". Continue to the next step. Open the Virtual Machine menu or Alt-click / Option-click the Parallels icon in the Mac menu bar (in the Crystal view mode) and click Configure. 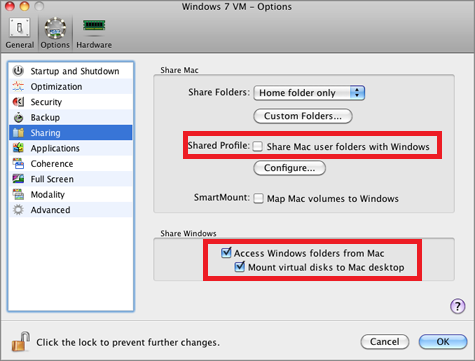 In the Virtual Machine Configuration window, click Options and select Sharing in the sidebar. Uncheck the "Shared Profile" box. Check "Access Windows folders from Mac" and "Mount virtual disks to Mac desktop"
The configuration panel may be different depending on the Parallels version. 8. If the path of your experience in the Windows title bar of Composer still contains "\psf....\myExperience.ifx" then, in Composer, choose the Save As option and create a new experience with a Windows compliant path (e.g. C:\User...myExperience.ifx). Use this new experience. Although it is true that you will have better performance using Boot Camp, it may not be sufficient to justify the inability to access the MacOS experience at the same time. In fact, you may decide to use a solution like Parallels when working with Composer but deploy Player into the field using Boot Camp. The choice is a personal one for you, your team and/or your client. Here is a good article comparing Parallels 11 vs Fusion 8 vs VirtualBox 5.